Through the 1930s and 1940s and on into the 1950s, designer experimented with not just different materials, so here shaped plywood, but also looked for new and unconventional forms of construction. 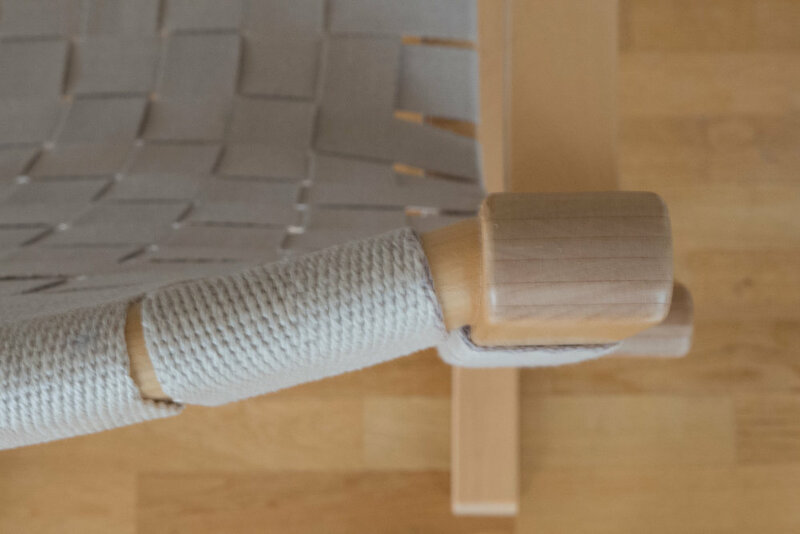 Of course, the geometry of the form of Wegner's chair is actually rather more sophisticated than a trestle. The key part of the structure is an H shape at the front with robust turned and tapered uprights or posts with a cross bar that is the support for the front of the seat. 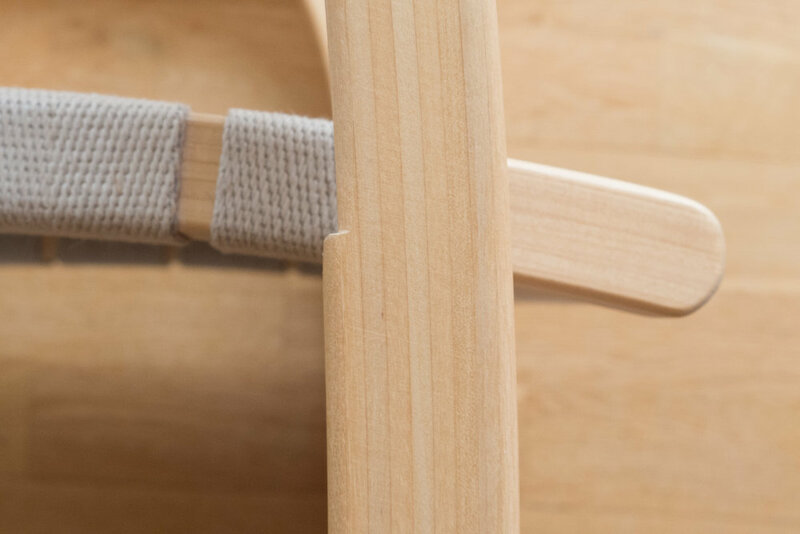 This primary H frame is not upright but leans backwards and is supported by a second similar but much shorter H shape that is propped against it and the cross bar of that back H supports the back of the seat that is slotted into the cross bar. Where the shorter back support meets the taller front posts there are short and shaped arm rests, housed and cantilevered forward, very close to the form of the arm rests on the Peacock Chair by Wegner. There is a deep back rest in plywood, with a level top but bowed downwards across the bottom and slightly curved inwards. This is not fixed across the uprights but held between them with lugs at the top and bottom, on each side, shaped from the back rest itself and held in slots on the inward facing edges of the pots so a form very close to the way that Alvar Aalto fixed the curved plywood shells of his chairs between the bentwood frames of the supports on each side. 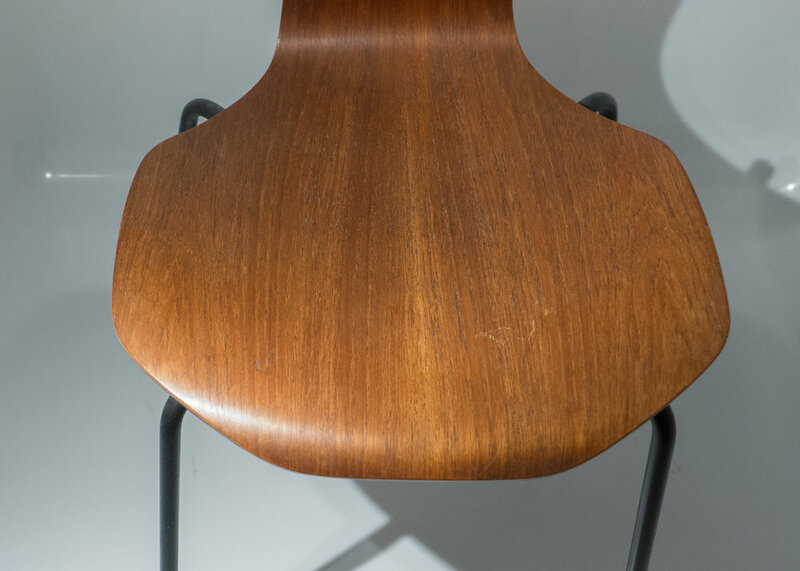 For comparison, in the following year, Wegner designed a dining chair Carl Hansen - CH29 - that is closely related in its form to the Sawbuck Chair. * The name of the chair implies a sawbuck was a direct inspiration but sometimes these names were applied subsequently if the form reminded people of something … the case with the Wishbone Chair. Sometimes good design is about designing something better and sometimes it's about designing something different and, without doubt, it was the exploration of what many could see as unconventional styles and forms that drove forward Danish design through the 1960s and 1970s. 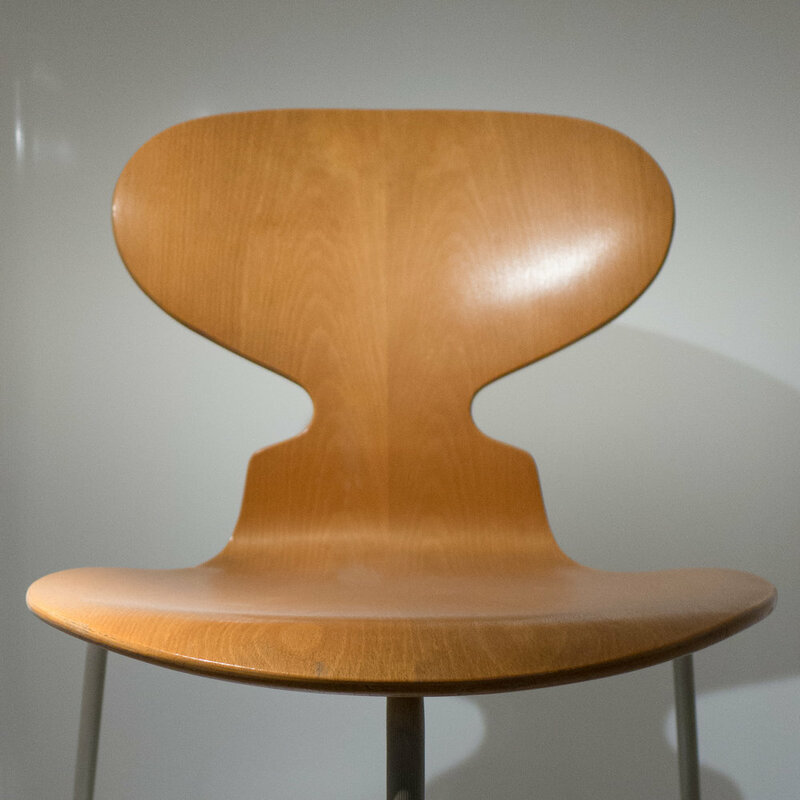 This shell chair by Hans Wegner, designed in 1963, could certainly not be described as conventional as it was one of his most sculptural but one of his most starkly simple designs. First drawings for the chair show a more squared-off back than was made for the final version with a slight downward curve across the top but with sharp outer corners and that emphasised that the sides of the back rest followed up in line from the angle of the front legs. There are just four parts to the chair with a wide and curved seat in thick plywood with an outline close to the shape of a segment of orange and a back rest as a separate piece, gently curved and with a complex shape, tapered towards the top, with all corners generously rounded and the angles of the sides set by the angle of the legs below when seen from the front. The frame of the legs is in bent wood with two front legs from a single piece of wood that forms a saddle shape to support the seat. There is a single back leg formed from a single elongated triangle of wood that is taken back from the cross bar of the front legs, under the seat, and then first up behind the back rest to support it and set its angle and then swept back down to the ground. In the prototypes these leg pieces were a single uniform thickness but in the final design they are split and divided at crucial points at the curve between the front leg and the part that runs under the seat and at the point on the back leg where it reaches its highest point and then is curved sharply to run down to the ground.